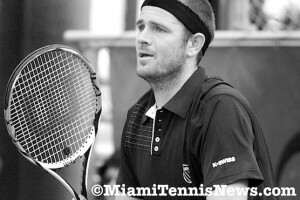 Tag Archive | "Del Potro"
Mardy Fish avenged his Delray semifinal loss today. 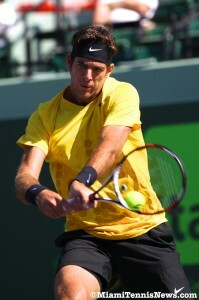 Fish toppled Juan Martin Del Potro in 7-5, 7-6 to qualify for his first quarterfinal at the Sony Ericsson Open. Following steady play from both competitors, Fish was the first to get a break point in the eighth game of the initial set. Del Potro blotted that out to level the set at 4 all. In the subsequent game, Del Potro had five break points but failed to capitalize. Perhaps a tad disappointed, Del Potro found himself in a love-40 hole. However, the Argentine dug himself out and drew even with Fish. 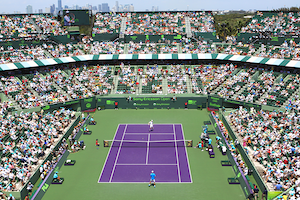 Yet, serving to extend the first set to a tiebreaker, Del Potro got down double break point and could not recover. As such, Fish banked the first set. In the second set, Fish seized a break to go up 3-2. But, Del Potro rebounded quickly and erased the deficit. With neither man surrendering another service game, the second set went to a tiebreaker. Fish sprinted to a 5-0 lead in the tiebreaker. Although Del Potro narrowed the gap to 6-5. On his third attempt at match point, Fish converted. Fish was content with his play “it was one of those matches that a couple points here and there and you lose the match. . . He had a ton of break points. I had a few and converted on two of them; he got me on one. . . It was high quality tennis for the better part of it, I think. I’m sure he came off thinking he played pretty well and I played great”.